Is gold a commodity? It is, from the physicochemical point of view, a precious metal, which is mined just like any other commodity. In that context, it is therefore not a security, but a tangible, hard or real asset. However, it is also a unique commodity behaving more like a monetary asset. From the investment point of view, the inverse relationship of gold with the U.S. dollar is practically the solely feature it has in common with other commodities. The yellow metal is very weakly correlated with other commodities (except silver), and according to the World Gold Council, it “is less exposed to swings in business cycles, typically exhibits lower volatility, and tends to be significantly more robust at times of financial duress” than other commodities. Moreover, gold is less used in industry; hence it is also less exposed to the business cycle, while its production is geographically diversified. Its sources of demand are more diverse, which makes gold less volatile and less exposed to specific risks than other commodities. And because gold is one of the densest elements, it is much easier to store than other commodities. What else differentiates gold from other commodities? The yellow metal is almost indestructible – practically all gold that has ever been mined still exists in some form. Thus, the ratio of stocks to annual flows is much larger for gold than for other commodities (see the chart 1). Thanks to this feature, gold is much less prone to production shocks as the price of gold does not depend so much on current production. Any shortages can be relatively quickly fulfilled by recycled gold from the aboveground stocks. Contrarily, any positive supply shocks (sudden increase in mining output) affect the gold prices in a limited way, because the annual mining production is only a tiny fraction of the total gold holdings. Hence, the gold price is mainly driven by demand and changes in reserves rather than by the supply from the gold mines. The unique features of gold (except the above, the yellow metal is durable, easily recognizable, storable, portable, divisible and easily standardized) explain why this precious metal has been used as money for thousands of years, until 1971. This is, incidentally, another distinct feature of gold compared to other commodities (except silver). Its historical relevance as a monetary asset explains why gold still behaves like a currency, despite the fact that the gold standard ended more than forty years ago. Actually, the gold market is very large and liquid compared not only to other commodities, but also to currency or debt markets. 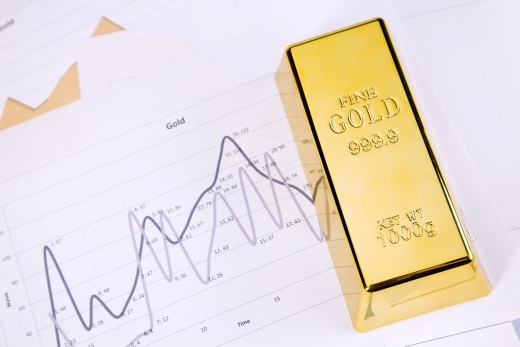 And gold – again unlike other commodities – is still held by central banks and governments as a reserve asset (in fact, it is after the U.S. dollar and euro the third largest reserve asset in the world, according to the World Gold Council). To complicate matter even worse, gold differs not only from other commodities, but also from other currencies. The yellow metal is a tangible asset, so it cannot be printed like fiat currencies. Thanks to its relatively inelastic supply, gold preserves its purchasing power, thus serving as a hedge against governments’ madness and as a safe haven during financial turmoil. In that sense it is not a currency, since we cannot buy goods and services with gold coins or bars, but is rather an anti-fiat currency, bought when the trust in central banks and governments diminishes. Ironically, those central banks buy and hold gold themselves. In other words, gold does not depend on any single government or central bank, hence its price is not influenced by political decisions or the solvency of any institution. Thus, gold is a global monetary asset, which reflects global developments and which is heavily traded on the spot market (unlike commodities traded mostly on the futures market, but similarly to currencies). Gold is neither commodity nor currency. It combines the features of both making it commodity money, i.e. a commodity which historically has been chosen as money and still remains a global monetary asset. No arbitrary political actions can increase its supply, and it has no counterparty risk (this is why it has no yield), hence it is still traded like currency or insurance against fiat currencies and market instability inherently connected to paper money. Would you like to understand the nature of gold? We focus on the fundamental analysis in our monthly Market Overview reports; however, we provide also Gold & Silver Trading Alerts with clear buy and sell signals. If you’re not ready to subscribe yet, we urge you to join our gold newsletter today. It’s free and if you don’t like it, you can easily unsubscribe.